(NaturalNews) Humans have partaken in alcohol consumption for as long as we can remember; in fact, scientists traced the origins of brewing back to 10 million years ago after discovering that "our primate ancestors evolved the ability to metabolize alcohol," according to the Los Angeles Times. However, it wasn't until now that a safer way to drink existed. But unfortunately, as is often the case with other human rights, the United States government is preventing access to it, and ironically, in the name of safety. As we've previously reported, a company named Chigurupati Technologies has discovered something remarkable: a naturally occurring molecule that, when infused into booze, protects the liver from the health effects of alcohol consumption; it also shields against damage caused by drinking alcohol and taking Tylenol, a deadly concoction that kills thousands each year. Though the technology has the ability to revolutionize the way we view booze, there's just one problem: The agency responsible for regulating labeling on alcoholic beverages, the Alcohol and Tobacco Tax and Trade Bureau (TTB), won't allow it. Their policy absolutely prohibits the addition of health claims on alcohol beverages. Period. Even though it's considered scientific fact that there are health benefits associated with moderate alcohol intake. Curious as to why the government wouldn't want to make drinking safer, we reached out to TTB, firing off around six emails, requesting information about their policy on alcoholic beverage labeling, and their thoughts on NTX. We received two responses. The first was from Tom Hogue, Congressional Liaison and Public and Media Affairs for TTB, who replied: "This matter is currently under investigation, and I am, consequently, unable to comment further at this time." Though we're unsure what "investigation" he's referring to, we received information that a lawsuit may have been filed against the TTB by a spirit maker using NTX technology in a product called Bellion Vodka. Tightlipped over the TTB's strict regulations regarding health claims on alcohol, Bellion Vodka is forced to advertise their product using extremely vague language. 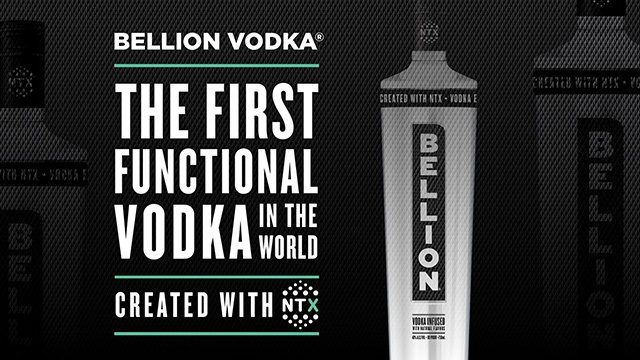 Their website describes the spirit as being a "smarter way to drink, while a post on its Facebook page simply reads: "Bellion Vodka created with NTX. That's all we're allowed to say." The purpose of NTX technology is completely defeated if its makers are barred from advertising its benefits. The second response we received was from Mary Aiello, Marketing Practices Coordinator with the Texas Alcoholic Beverage Commission (TABC), who essentially said oversight of alcoholic beverage labeling is the sole responsibility of the feds (in this case the TTB). This means that states have no authority over what goes on the labels of alcoholic beverages. The NTX molecule is naturally derived from a combination of licorice root and a functional sugar known as mannitol. Glycyrrhizin, an extract of licorice root, "has been repeatedly and scientifically shown to block nearly all liver damage from both alcohol consumption and over-the-counter Tylenol pills (acetaminophen)," Health Ranger Mike Adams reported for Natural News. Seven scientific studies have displayed the molecule's ability to provide "'hepatoprotective' effects (meaning it protects the liver) from the cellular damage caused by alcohol and Tylenol. It also happens to exhibit strong anti-viral, anti-tumor and anti-inflammation effects at the same time [emphasis added]," Adams explained. "This may be the closest thing to a 'miracle cure' for liver disease, cirrhosis and liver cancer that's ever been discovered. Yet nobody in the pharmaceutical industry has ever mentioned it." The studies show that NTX can reduce harmful effects on the liver by up to 93 percent! The molecule works by turbo-charging our glutathione levels, which is the main detoxifier of alcohol. People suffering from immunosuppression or a poor immune system tend to have low glutathione levels, which are quickly used up when they drink, thus leaving their liver defenseless against the effects of alcohol. However, clinical studies showed that when these people drank NTX-infused alcohol, their glutathione levels significantly increased. "NTX may play a protective role in supporting improved liver health during alcohol consumption," explained Mike Adams in an episode of the Health Ranger Report, citing published research. Evidence of the molecule's beneficial effects is "supported by statistically significant increases in markers of acute liver injury in the placebo group only, as well as increases in the glutathione levels in the active group, which were over 10-fold higher than the changes in the placebo group." So there you have it. The impacts of NTX are not slight but are in fact substantial. "No one had ever done this in the market so far. Other than the fact that I like spirits and I wanted something better for the liver, it was an easy thing to get into because [this] market is the most un-evolved, non-innovative market in the world," said NTX inventor Harsha Chigurupati. "Science has not been used in any way to benefit real consumer experience."